I have a bowl of warm mouthwatering soup in my hands and trying to think what I can write about today’s post. I am thinking……. still thinking……. Well, as always, no brain storming ideas coming to my mind. So I clicked on the song “Desperado” by Eagles on Youtube, and started thinking again… Gosh! that song is killing me. Today is the kind of day that I tend to “blah-blah” a lot with my recipe. So be patient with me, please. 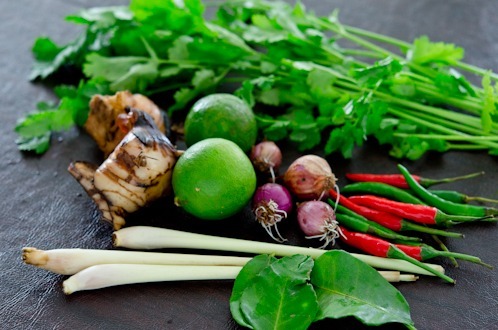 There are many different kinds of soups in Thailand. But I always come back for this hot and sour prawn soup called, “Tom Yum Goong“, as my favorite. Just thinking of this soup alone makes my mouth salivating. 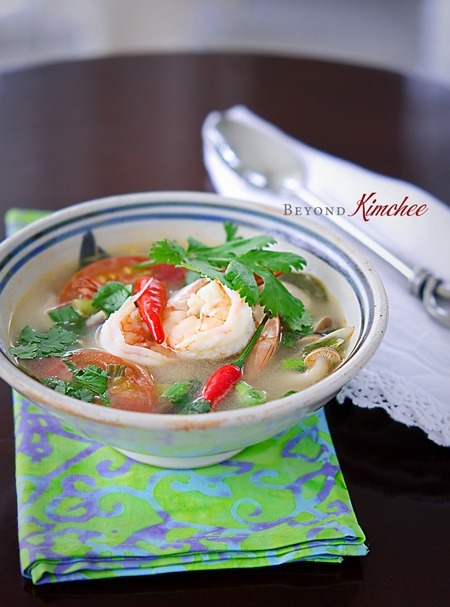 Tom Yum Goong is perhaps the most well known dish of Thailand. With its sensationalizing flavor contrast and aroma, it surely awakes your taste bud on your tongue. I learned how to make this appetizing soup from my Thai friend many years ago. Ever since then, it became my repertoire soup when I need an Asian comfort any time of the year. 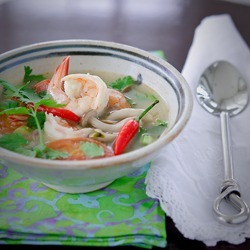 I think Tom Yum Goong can be a great remedy for cold and flu. It can clear out your sinus like a plumber opening up the old clogged kitchen sink pipe. The degree of spiciness and the sourness can be achieved by your liking. Some add cow milk at the end to neutralize the spiciness. Some add coconut milk to make it creamy — then it sort of becomes a different soup called “Tom Khaa”. 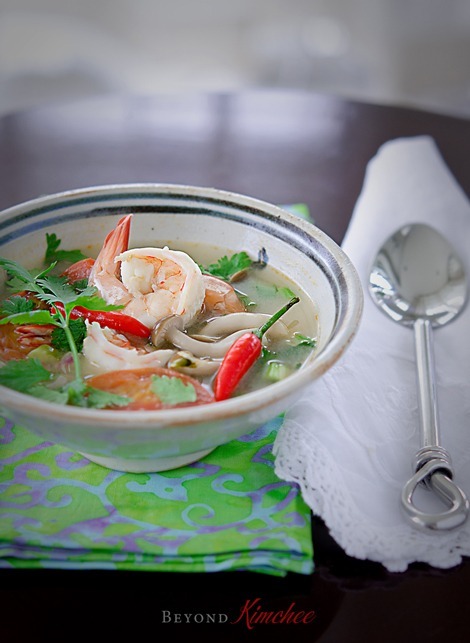 You can use chicken if you are not fond of prawns but you gotta allow prawns to be the highlight of this soup. 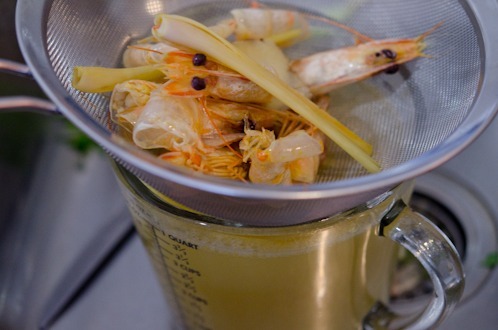 A good soup starts with a good base; in this case, prawns! Yes, you are going to peel these little cutie pies with your own delicate hands. 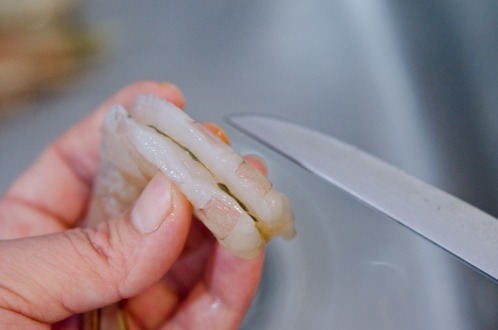 Remove the head and the shell from the prawn but leave the tail intact. Slit along the back of prawn and you will discover the vein. Take that gunk out. Save their heads and shells. DO NOT throw away! You need them from their head to toe to get the most flavorful soup. I know, they sort of look “d-e-a-d”, so I will show you more uplifting shot. Here, much better! 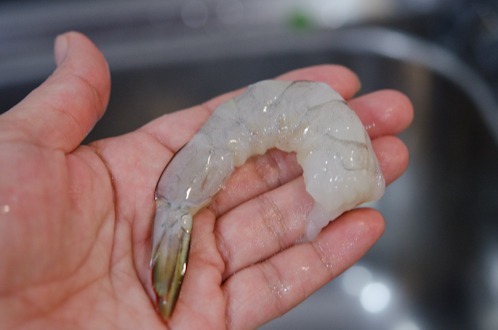 This is the actual prawn that you’re gonna eat! 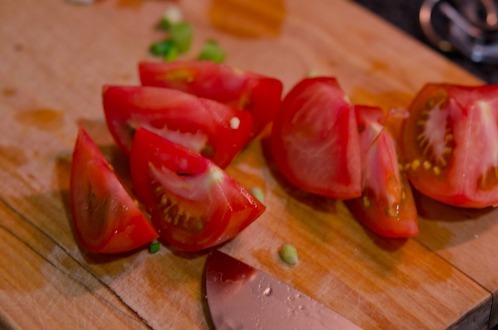 …after being cooked. Smack one lemongrass with your manly fist or back of your knife. And smell it! 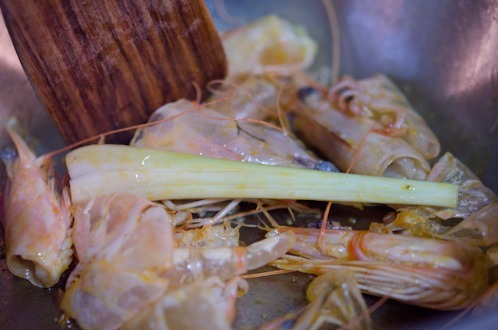 Saute the prawn heads and shells with the lemongrass in hot oil for 3 minutes. 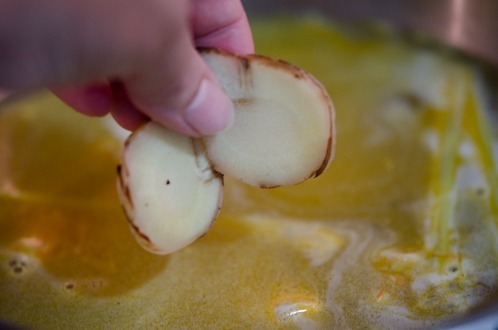 Add chicken stock and two slices of galangal. Drain the stock and reserve about 3 cups. Discard the rest. Adios, Prawns! 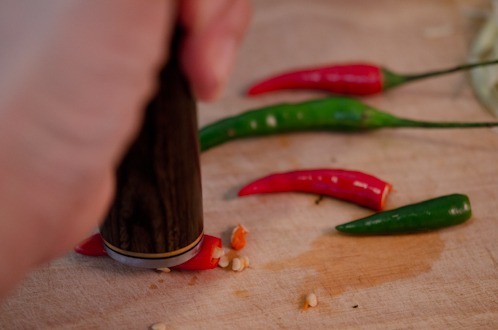 Smack these tiny Thai chili, aka the killer! I accidentally chew one of these in Thai papaya salad one night (they were even smaller than these) and it *literally* killed me. I ended up crying with tears, seriously!How many will you need? Depends on how many you can handle. You don’t actually eat them but they will yield the spicy kick in the soup. Get your mushroom ready. 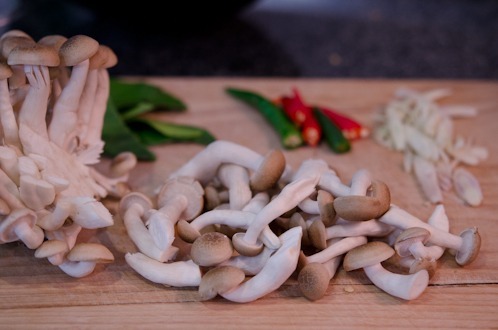 Straw mushroom is the traditional choice, but oyster or wild enoki mushrooms will do fine. Slice the other lemongrass thinly. Now the kaffir lime leaves. 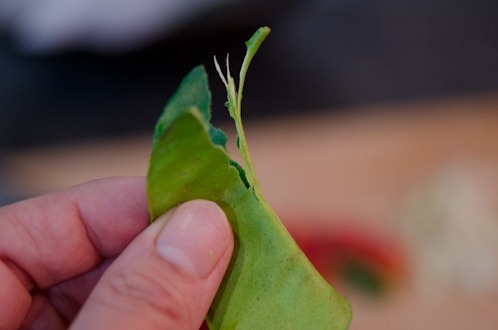 Pull off the stem on the back of the leaf. It will cast the most aromatic smell right under your nose. 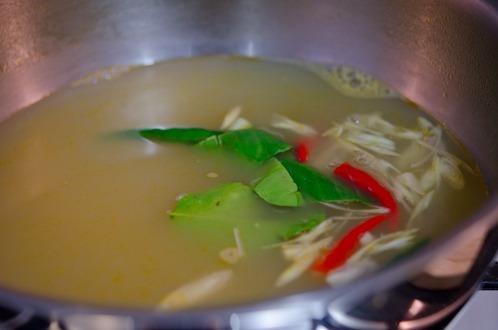 Throw kaffir lime leaves, chilies, and lemongrass in the stock and let it boil. And the best part, add the lime juice. Adjust amount of lime juice depends on how sour your tongue desire. I like slightly on the sour side. 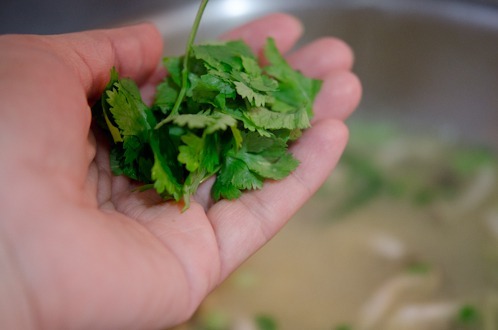 Lastly throw some cilantro (or coriander leaves depends on whom you talk to) at the end. Okay, the soup is ready to serve. Serve with jasmine rice as a meal, or eat alone as an appetizer. I’ve been listening the “Desperado” about 5 times already. Nobody makes songs like this anymore. … and I am thankful. 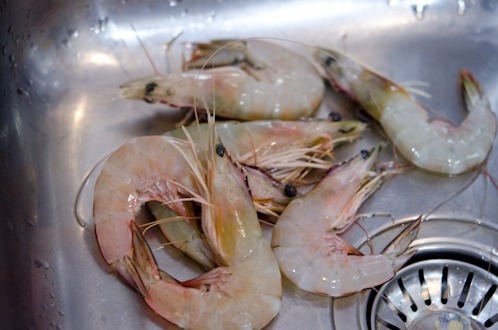 Clean the shrimp by removing heads and shells but tails intact, reserve the heads and the shells. Discard the vein. Set aside. Smack one of lemongrass with back of your knife to release its fragrance. 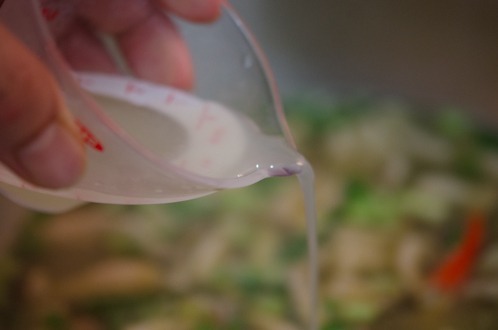 Heat oil in a soup pot over medium high heat, add the reserved shrimp heads and shells, and the one smashed lemongrass. Saute together for 3 minutes. Add chicken stock and galangal, let it boil first and then simmer over low heat for 20 minutes. 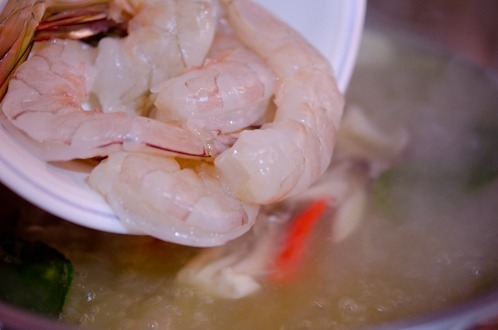 Strain the stock and discard the shrimp heads & shells, lemongrass, and galangal pieces. Slice the other lemongrass thinly. Pour the stock back to the pot over medium high heat, add the sliced lemongrass, chili, lime leaves, and shallot, and bring them to boil. Add shrimp, mushroom, and tomato, and continue to cook. Season with fish sauce. Remove the pot from heat and add the lime juice. Good picture! And a good soup - I love any kind of hot and sour soup, but usually make the Chinese version rather than the Thai. 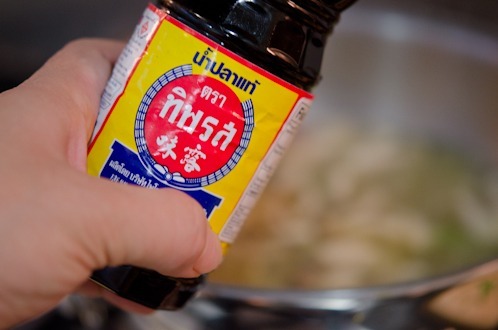 A mistake, because the Thai has so much more flavor. And native English speakers (most of us, at least) don't quite understand what cats and dogs have to do with heavy rain, either! ;-) Good stuff - thanks. 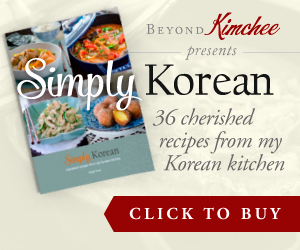 Hi Holly, love your recipes, I'm a Korean food fan and living in Japan at the moment, I hope to visit Korea soon! I'm from England so just wanted to correct your phrase at the beginning of this article. We say "it's raining cats and dogs outside" with cats said first and dogs second. There is no known origin of this idiom, I guess it's just become part of our language with time! Thank you David for correcting! I'm so excited to learn how to make one of my favorite soups! My mouth is watering looking at these photos. And I'm incredibly envious of those gorgeous, fresh kaffir lime leaves (I usually have to buy them frozen). Beautiful! Here you go! In the 1500's "Houses had thatched roofs-thick straw-piled high, with no wood underneath. It was the only place for animals to get warm, so all the cats and other small animals (mice, bugs)lived in the roof. When it rained it became slippery and sometimes the animals would slip and fall off the roof... Hence the saying "It's raining cats and dogs." 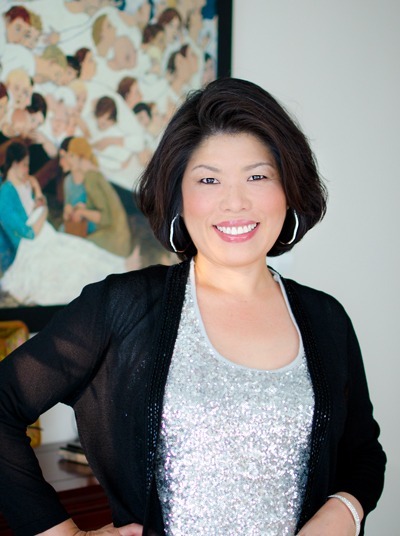 I love your blog sooooo soooo much! Thanks for the explanation. Now I a know why they call it that way. I love hot and sour soup, thank you for the recipe! 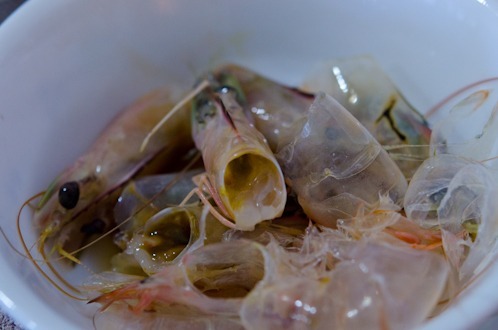 Even the shells from the shrimp look pretty on your photos. Great soup! I had to use chicken instead due to a food allergy, but still yum! Also, though the sources for "raining cats & dogs" listed before are common beliefs, there's no known origin for the phrase. My favored etymology is “cats and dogs” may be a perversion of the now obsolete word catadupe. In old English, catadupe meant a cataract or waterfall. A version of catadupe existed in many old languages.In Latin, for example, catadupa. was borrowed from the classical Greek κατάδουποι, which referred to the cataracts of the Nile River. So, to say it’s raining “cats and dogs” might be to say it’s raining waterfalls. Taken from the U.S. Library of Congress website: http://www.loc.gov/rr/scitech/mysteries/rainingcats.html Another aside: I love the photos you take. It will serve about 4 as an appetizer. Hope you enjoy! Thanks.